A structure of obvious historical significance to the people of Trinity, St. Paul's School was the one building familiar to virtually every child growing up in the community between 1910 and 1964. 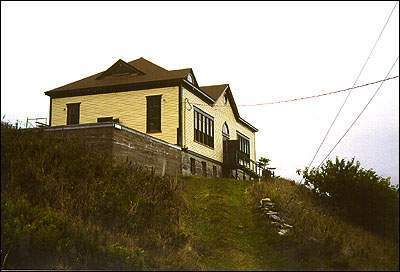 St. Paul's Anglican School is a good example of a kind of schoolhouse built in outport Newfoundland in the early 20th century. Built in 1910 the school personifies many of the schools built in the outports of Newfoundland at that time. A small building, it only had two rooms that accommodated up to six grades each. As was common in most communities, one teacher was expected to teach in each classroom. The school remained the primary site of education for children in Trinity for decades. A third classroom was added in 1955 to handle extra students. However, as Newfoundland's education system expanded and improved, schools like this gradually began to fade away. In 1964 the school was closed and turned over to the Trinity Historical Society. In 1989 Aiden and Elizabeth Duff, who began the extensive repair work necessary to restore the school, purchased the building. The school is now used as a private residence. St. Paul's School is located on top of Gun Hill, the highest point in Trinity. The site is also the location of the old courthouse, torn down sometime at the turn of the twentieth century. Because of the school's location, it is visible from almost any point in the community. The original school was a wood-framed structure with a steeply-pitched roof. Its most distinctive feature may be the windows, which are dormers with half-round windows. There is a circular window over the entrance. The school also has a cupola, exterior trims and brackets. Over the years alterations have been made including replacing the original roof and removing the cupola. St. Paul's School was recognised as a Registered Heritage Structure in November 1989 and the owners were presented with a commemorative plaque by the Heritage Foundation of Newfoundland and Labrador in July 1998. Also view St. Paul's Anglican School Registered Heritage Structure on the Heritage Foundation of Newfoundland and Labrador web site. The Newfoundland and Labrador Heritage Web Site has on its site only a portion of the registered heritage structures in Newfoundland and Labrador. To view a complete list or search for a particular structure visit the Heritage Foundation's Property Search page.